Where can I download the ikUnderwater effect? How do I use the ikUnderwater effect? How can I make my MMD animation look like I filmed it underwater? You will go through the same screens as you see in that Rhinestone tutorial. The ikUnderwater effect has a PMX Controller model. Load that first… and see that it needs to be translated into English before you can use it. 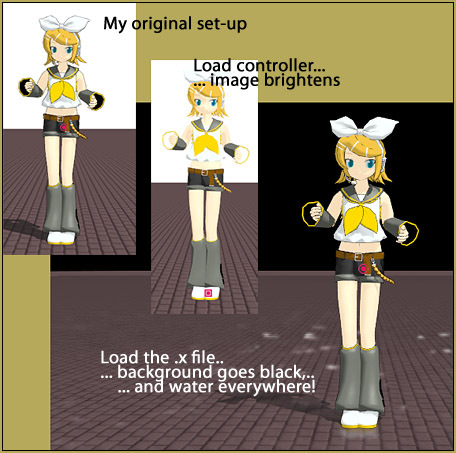 I DID translate the Controller model and I have it here in a ZIP folder for you to download. Also in that ZIP is a translation of the README file… that README has the author’s instructions. For the demo video, I created that big flat floor in Sketchup and used the 3D-Rad plugin to save it as a .x Accessory for MMD. I tried using a couple of my different stages and found that the “God Ray” in this effect was blocked by walls, and such, in my stage setting… so I went with a simple flat floor as the way to best show the effect. The Controller has two bones… a Center and a Mother (All Parent)… and they arrive stacked one-on-top-of-the-other. 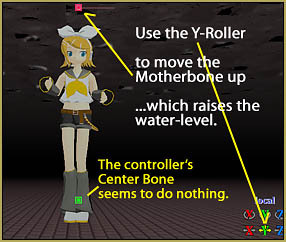 The Center bone doesn’t seem to do anything, so move it aside and click on that hidden Motherbone. Use the Y roller to move that bone up… increases the depth of the “water”. Adjust that bone using any of the XYZ rollers to shine the God Rays where you want them. Adjust the sliders to get your rays (the R, G and B sliders in the Eyes section). The effect Controller has many sliders… go for it! … try them out. See the author’s instructions in that README file. He tells us how to modify the effect by editing the .fx file. In reading that README, I believe that we should see “squiggles” on the floor, but I was not able to make that happen. If YOU figure that out, please leave a comment after the end of this tutorial. I look forward to adding your info to this tutorial! 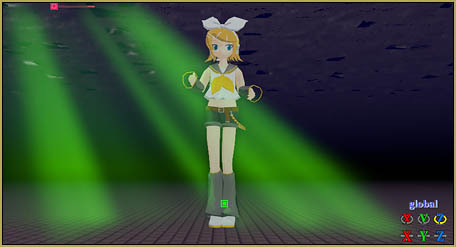 I loaded the same motion file (from our Mahlazer’s “Feel the Sound” download) onto both the Animasa Rin and the galaktika537 Rin Mermaid models. 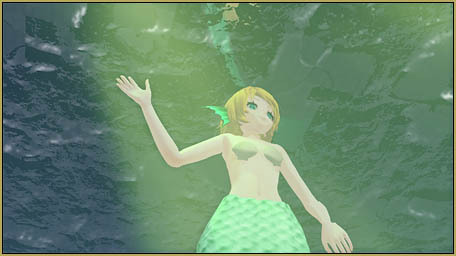 The mermaid looks great… but, being a “family show”, I had to turn off MMD’s physics in order to keep the mermaids clam-shells in place! With physics “on”, they tend to fly all over the place, uncovering, well, what they cover. She DOES have a series of adjustable bones in her body and tail, allowing for a detailed fish-like animation… but I did nothing with them for this tutorial demo. I twisted Miku’s Ievan Polkka in Audacity, using parts of it playing backwards with some portions alternately louder or quieter, to enhance the underwater sensation. There you go … more to learn! This just gets your feet wet with the ikUnderwater Effect. There’s plenty more to discover. 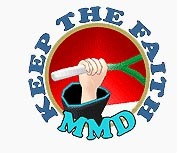 … and when you DO discover something, please leave a comment. Thank you!